It’s Leftovers time! This month I had the pleasure of being partnered up with Ruthy from Omeletta. Ruthy recently moved to Long Island and is pregnant! Congratulations on the move, mommy-to-be! I love Ruthy’s site; her recipes are really innovative, using very creative combinations of ingredients. Like these Cherry Balsamic Cheesecake Bars. I am a huge fan of cherries and I love balsamic, especially the way it amplifies the flavor in various fruits like strawberries, blueberries, blackberries and raspberries. But I have never thought about pairing it with cherries. Genius. And this Grilled Peach, Heirloom Tomato and Fresh Mozzarella Salad sounds like the perfect way to say farewell to summer and its delicious ingredients. One thing I love about Ruthy’s blog is the 5 Great Recipes series, showcasing (duh) 5 great recipes for a seasonal ingredient or theme. Like I said, she’s pretty creative. I’m definitely going to check out the sweet potato recipes for the upcoming season. If you like to incorporate a lot of fresh ingredients in your cooking and are looking for new ways to use your favorite foods, you need to check out Omeletta. For this month’s Leftovers Club recipe, I really took the word “leftovers” to heart. Instead of baking something, and sending off the extras to Ruthy, I went through my kitchen and looked for ingredients that I had lying around just waiting to be used up. Walnuts. I have somehow accrued an enormous amount of walnuts. I don’t know why or how; they are my least favorite nut. But they were there. I like them in cookies, muffins or breads, but on their own, I don’t find them to have much flavor. SO, I knew I was making some kind of walnut baked good. I also had this homemade Fuzzy Navel Jam from The Boys Market in Delray. I had about 3/4 of the can left, and even though I loved it, I knew I wasn’t going to be finishing it any time soon. So now I have walnuts, and jam. What to make? Isn’t it obvious? Thumbprint cookies! I like to make my cookies with brown sugar only. I think it lends to a much richer taste without being too sweet. 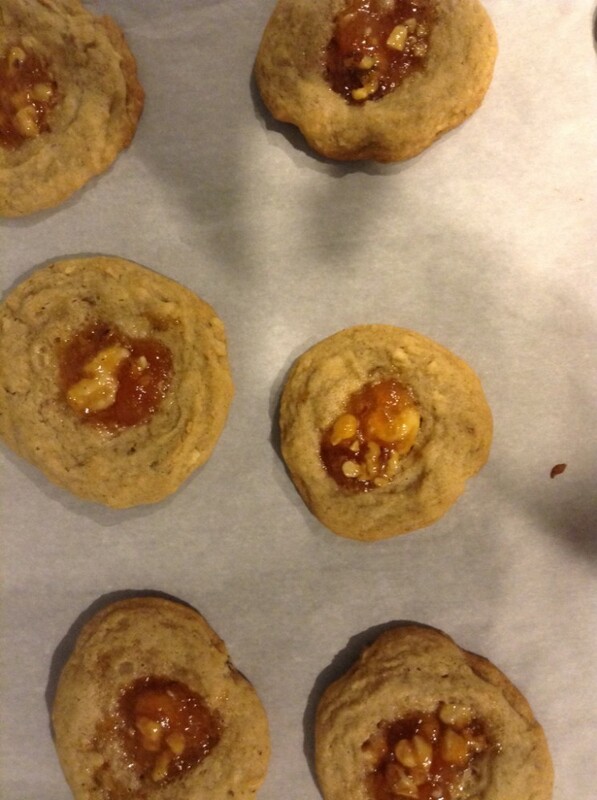 So I used a simple brown sugar cookie recipe and added in chopped walnuts, then I heated up the jam over the stove and stirred in more chopped walnuts to make a filling. I was afraid these cookieswould come out rather boring, but I was seriously, extremely, a million percent wrong. They were the perfect chewy consistency and the orangey-peachy flavor of the jam complimented the walnuts and brown sugar in such a made-for-each-other way, I almost couldn’t believe I came up with the recipe all on my own. Of course you can use whatever flavor jam you like, but I recommend something close to what I used. Orange, peach, mango, or apricot would all work really well. Preheat the oven to 350 degrees. In a small bowl, whisk together the flour, baking soda and cinnamon. Beat egg and brown sugar in the bowl of a stand mixer. Add egg and mix until creamy. Mix in dry ingredients until just combined. Stir in half of the chopped walnuts. Heat jam in a small saucepan over medium-high heat. Let cook until it becomes a liquid and then stir in the remaining chopping walnuts. Scoop cookies onto a baking mat or baking sheet lined with parchment paper. Press the center of each cookie with the back of a teaspoon. 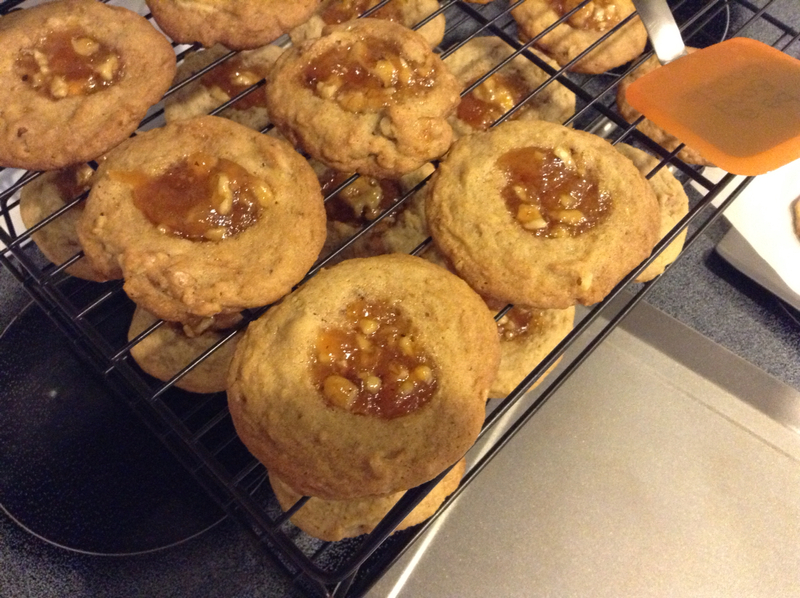 Place about a tablespoon of the jam and walnut filling into each cookie. Bake for 10-12 minutes. 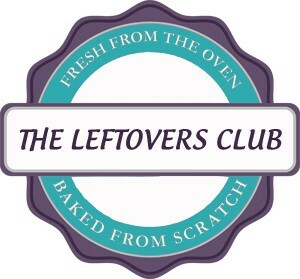 Make sure to check out of all #theLeftovers Club recipes. If you’re interested in joining us next month, go to theleftoversclub.com and sign up! These look completely yummy!! Great post! These thumbprints are definitely going to have to make an appearance on my Christmas cookie tray! Love the nutty fruity bites! There is something about inventing baking recipes that is seriously rewarding. Great job!